Make note that the level of heat will always be indicated in the post’s label. The scale is 0-5 peppers: 0 meaning no spice (which, although rare, will happen) and 5 meaning 3rd-circle-of-hell heat. Cook the jasmin rice according to package instructions. Meanwhile, heat a wok (deep skillet would work) to medium-high heat. Add oil and crushed pepper. 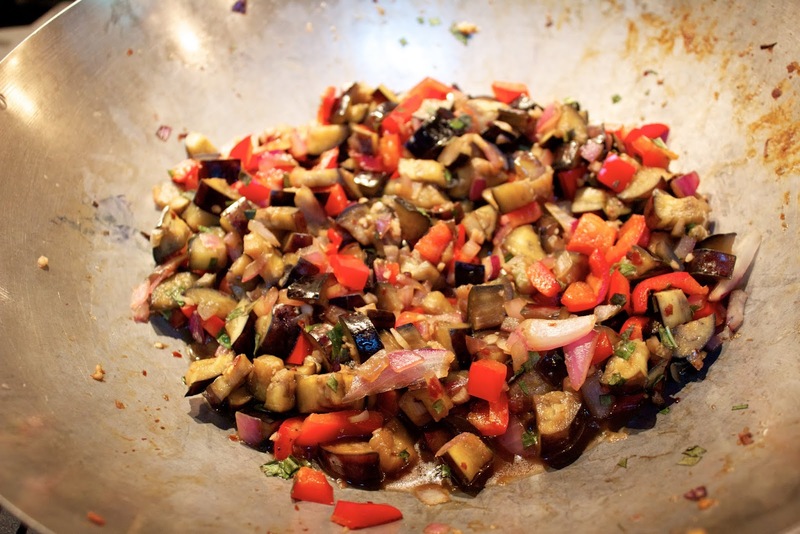 Cook for 15-20 seconds; then add the eggplant, and stir-fry for 2-3 minutes. Add the onion, bell pepper, and garlic, and stir-fry for 3-4 minutes more. Now incorporate the vinegar and tamari sauce into the mix. Sprinkle in the brown sugar, and toss for 1-2 minutes longer. Remove the pan from heat, and add the basil, tossing to combine. Serve with rice. This dish is gluten-free and would still be good with the sugar omitted. I love this dish because it is really flexible. If red peppers are hard to come by, this recipe will still do well with another kind of pepper or even another veggie completely (broccoli for example). The heat of the dish is also easily manipulated with the crushed red pepper. For a sweeter dish, the crushed red pepper could be omitted and an extra tablespoon of brown sugar could be added. For those of us that can’t go an evening without protein in our dinner, add a cooked chicken breast or two, turning this dish from a side to the main course. Everything looks too yummy and delicious!